Bad Steering Rack: Signs To Look Out For! When you’re driving, you tend to know how your steering should feel, so if you notice anything off with it, any signs that there may be a fault in the power steering system, or specifically an issue with the steering rack, it can be quite worrying. Unfortunately, it’s not an easy diagnosis when it comes to figuring out the root cause of your steering problem, as there are quite a few components that could be the culprit. 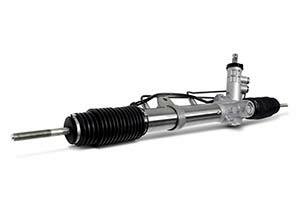 So how can you tell if you have a bad steering rack? Look out for the following signs! Whether you’re cruising or booting it, if you find your vehicle wandering a little, this may be a symptom of a faulty steering rack. You’ll notice this if you find that you’re having to grip onto the wheel to keep it steady and stop it veering to the left or right too much when it should be going straight. There may be a chance that this sign can be caused by incorrect wheel alignment, however, if you notice that the tire tread is unusually worn from the inside or the outside of the tire, or more one side than the other, then this can be due to problems with the steering rack, opposed to the overall wear you get from bad wheel alignment. Your best option is to rule out any problems with wheel alignment and then start thinking about having your steering rack checked. Does your car make grinding noises when you turn corners at low speeds? If so, it may be because of an overheated steering rack. When there is a lack of lubrication and excess heat, the metal components of the rack will make raw contact and grind against each other, hence the noises when you turn. When you get raw contact in the power steering system, it can create swarf in the fluid and metal filings will work their way through the system, blocking up filters and can cause premature failure of seals. This then means the system will need to be thoroughly flushed before fitting any replacement or remanufactured parts. When it comes to a burning smell, it’s difficult to pinpoint the cause, as it could be a number of components in your vehicle that could be overheating. However, the smell of power steering fluid resembles that of burnt oil, so if you’re driving and suddenly this aroma fills your car, you should stop immediately and call a mechanic, as it could mean your power steering system is overheating. If you feel a tightness in your steering wheel, the cause could be low power steering fluid. If this is the case, you may be facing a leak in the power steering system, as that is the only way you’ll find the levels of fluid decreasing. The leak can often be from a faulty seal in the rack and pinion, so it’s best to get your vehicle checked by a professional when you notice the problem. If you leave the leak unattended too for too long, it can cause the steering rack to produce excess heat, which can, in turn, produce the grinding sounds, as metal will connect with metal. Any of these signs seem familiar? If so, you may have a bad steering rack, so contact Power Steering Services today and we’ll have your steering rack in top shape again and your power steering system working efficiently! Tags : Bad Steering Rack, Bad Steering Rack Signs, Bad Steering Rack Symptoms, How To Diagnose Steering Rack Problems, Power Steering Rack Problems, Signs That You Have A Bad Steering Rack, Steering Rack Issues, Steering Rack Problems.